Linen is a versatile natural fabric made from the fibers of the flax plant. It’s known for its breathability, durability, and comfort, and for being wonderfully cool to wear in hot climates. It only gets better with age! It’s available in pure linen or blended with other fibers. 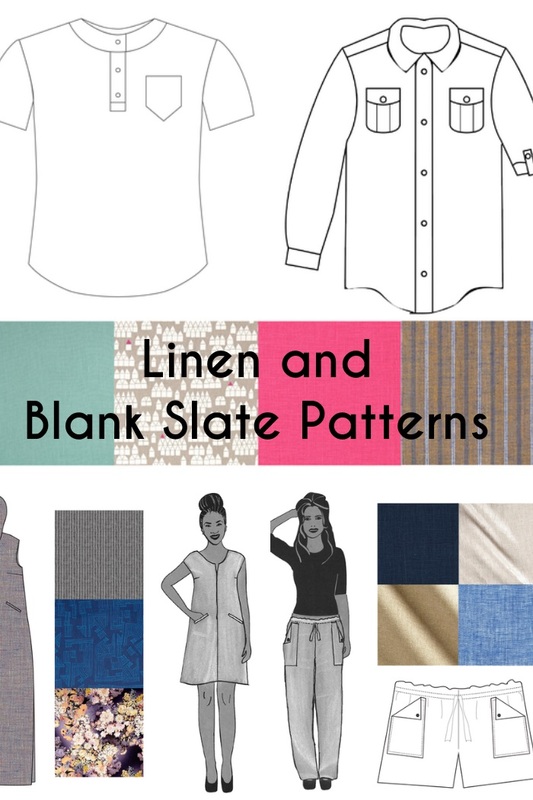 Each combination has unique properties – blending linen with rayon can give the fabric a nicer drape, for instance. Cotton/linen blends are offered in a variety of weights and prints, and they’re nice for apparel as well as bags and home dec.
Linen can be purchased in many neutral shades which really show off the texture of the fabric. This is my favorite substrate for the Oceanside Pants and Shorts! In addition to solid colors, you can also find chambray (with white weft yarn and dyed warp), and even metallic finishes. Tip: When linen is machine washed, it continues to soften over time, and the wrinkling decreases as well. Soaking linen garments for an hour or two prior to washing helps, because not getting fully saturated during a wash cycle can be one of the causes of the wrinkling. Also, ironing will be easiest if you remove it from the dryer when still slightly damp. Linen is also increasingly available in some great prints and yarn-dyed stripes. These would be really fun for a design like Leralynn, where the shape and minimal seamlines allow the fabric to shine. You could even play with the direction of stripes with the welts, hood, and dress panels! Tip: Linen is available in many different weights – from sheer lightweight to heavyweight upholstery. Play with the fabric to see it has the drape you want for your dress, and be sure to wash it at least once. Linen typically contains a lot of sizing from manufacturing, and it’s often much less stiff after washing. Linen is awesome for kids’ clothes too! It’s a strong fiber that can take a beating. The Prepster Pullover and Bookworm Button Up are both great patterns for lighter weight linen. Tip: Some linen fabrics can be shifty when you cut them, depending on their weight and blend. If you’re having issues with this, give the fabric a good starching, and cut in one layer (instead of on the fold).